The prevalence of fentanyl and fentanyl analogs throughout the Nation continues to spread at an alarming rate. The CDC’s National Center for Health Statistics reported drug overdoses involving fentanyl based on analysis of death certificates have increased 113% year over year between 2013 and 2016. In 2016, fentanyl was involved in nearly 29% of all reported overdose deaths, a significant increase compared to only 4% five years earlier. As the fight against this deadly drug continues, the DEA has received an increased number of requests for geographic data helping to identify trends and bring awareness at the Federal, State and local level. In response, the DEA has released the following collection of maps showing the distribution of drugs seized and analyzed by crime laboratories in 2016 and 2017 for fentanyl and selected fentanyl-related analogs by State. All data presented are from the laboratories that routinely submit drug chemistry analyses to the NFLIS-Drug. The National Forensic Laboratory Information System (NFLIS) is a Drug Enforcement Administration (DEA) resource in monitoring drug abuse and trafficking. Current NFLIS data reflects the results from drug chemistry analyses conducted by nearly 280 Federal, State, and local forensic laboratories across the country, which represent an annual average of 1.6 million drug items processed each year. The geographic data presented is actual reported data or counts rather than based on estimates. The data represents only those items that were submitted to and analyzed by forensic laboratories. The data represents a snapshot of the NFLIS-Drug database as of June 16, 2018. New Hampshire, Ohio, and Massachusetts had the highest rates of fentanyl reports in NFLIS-Drug, with about 172, 124, and 113 reports per 100,000 persons aged 15 or older in 2017, respectively. 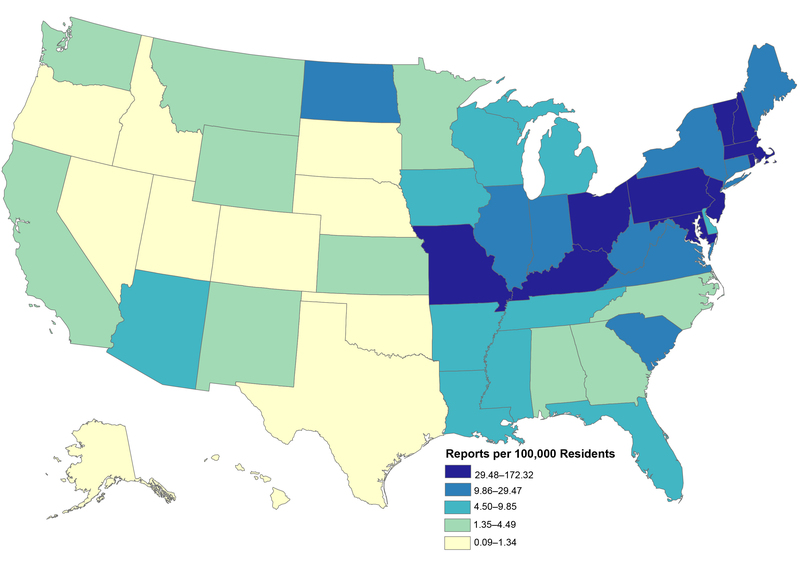 Alaska, Colorado, Hawaii, Nebraska, Nevada, South Dakota, and Utah had fewer than one report per 100,000 persons aged 15 or older. 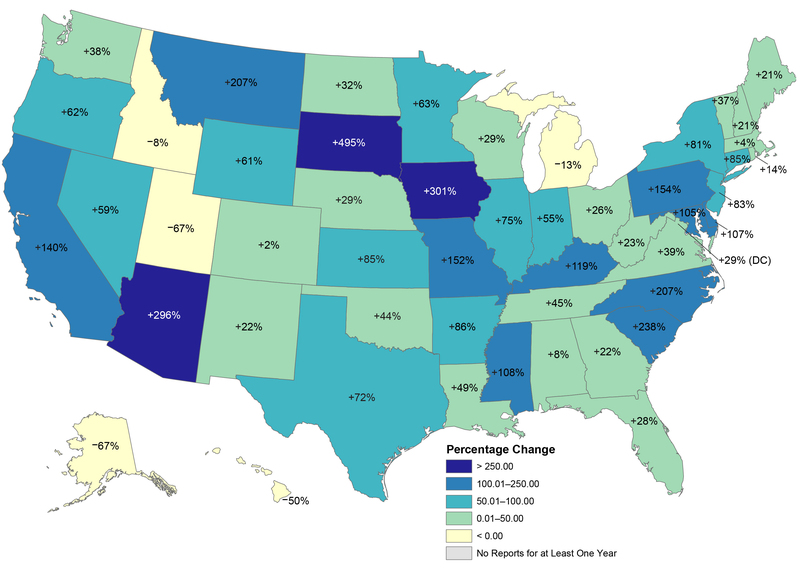 All States except Idaho, Michigan, and Utah had a percentage increase in fentanyl reports from 2016 to 2017. South Dakota, Iowa, and Arizona had the largest percentage increases (495%, 301%, and 296%, respectively). More than 75% of States in 2017 had at least one carfentanil report. Twenty States and the District of Columbia had carfentanil reports in 2017 but not in 2016. 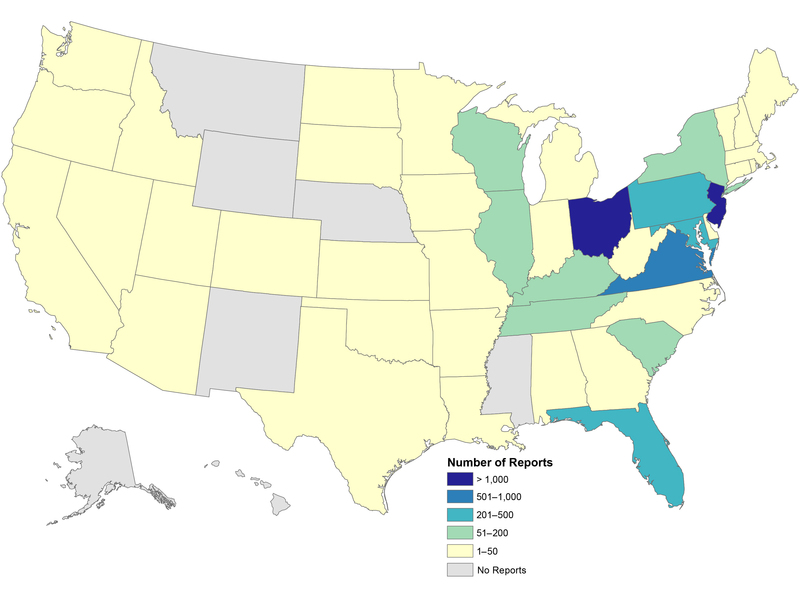 Of all the States having at least one carfentanil report, Ohio had the largest number (4,506 reports). 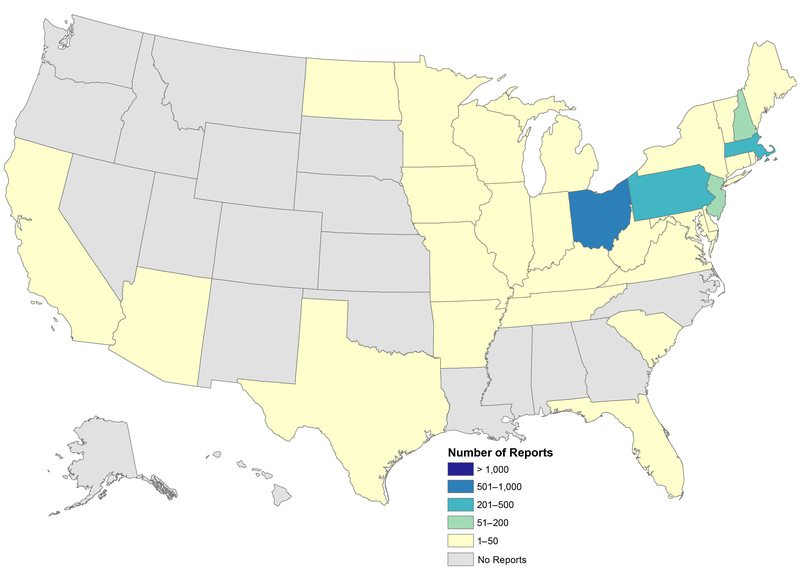 During 2016, 37 States reported analyzing furanyl fentanyl. Six States identifed 20 to 49 furanyl fentanyl reports, four States identifed 50 to 99 reports, and four States identifed 100 or more reports. Almost two-thirds of States had at least one acetyl fentanyl report in 2017. Massachusetts, New Jersey, Ohio, and Pennsylvania had the highest number (more than 100) of acetyl fentanyl reports. As the frequency of reported cases involving fentanyl and fentanyl analogs increases, it is imperative that drug-testing laboratories continue to evolve their services and detection methods. As a strategic drug-testing partner for agencies throughout the country, Premier Biotech has developed innovative, cutting-edge technology and laboratory solutions, equipping our customers with the tools necessary to detect, treat and action against fentanyl. Premier Biotech has developed an extensive laboratory confirmation method for the detection of 12 different compounds of fentanyl including Carfentanil, Furanyl Fentanyl, Acetyl Fentanyl and more. This method allows us to provide our customers with accurate results as we gather statistical analytics and uncover trends that help arm our partners with the information they need to make informed decisions. Contact Premier Biotech to discuss our products and laboratory solutions for the detection of fentanyl.